San Francisco and Beyond this is your definitive guide. Just the facts. Is there anything more annoying than the whiny, high-pitched hum of a mosquito? Puts a damper on summer fun, doesn’t it? The excessive moisture from heavy rains has lingered and in some areas narrow creeks and streams are still visible. Their standing water is the mosquitoes breeding ground. The threat of Zika and West Nile Virus is low in the San Francisco Bay Area. But, cases have been reported. Last year there were 10 cases of Zika. Though West Nile virus has been observed mostly in Southern California, there were minor incidences of it in Sacramento and San Mateo. Our report is just the facts. It is unbiased and obtained from science and other reputable sources. There are a lot of myths and misinformation floating around. 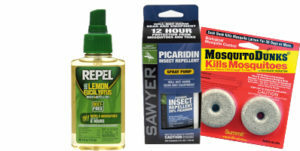 After drilling down, we found that the best protection from mosquitoes is mainly prevention and a few highly recommended products that have proven effectiveness. The article below organizes our recommendations for prevention, including the best deterrents and products you should avoid. One option not covered in this article is insecticide spray. For the obvious reason, most people decline that option unless absolutely necessary. Plus, a surprise finding of two plants with a myriad of uses from tincture to garnish. Eliminate standing water first. Pay attention to any containers in your yard. See products listings below if you can’t completely eliminate standing water. 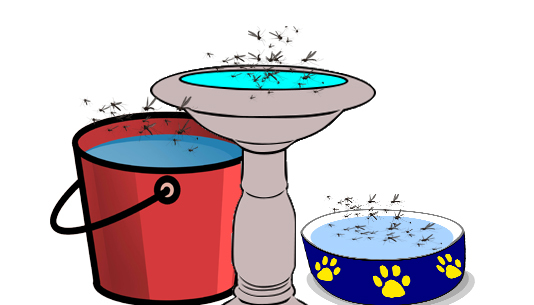 Buckets, bird baths and pet water bowls should be dumped and cleaned regularly. If you have a pool, make sure it is maintained regularly. Empty and keep clean plant saucers. Do not over irrigate. You will have standing water which will breed mosquitoes. We don’t normally promote products. However, these get such high marks from reputable third parties we think you should know about them. If you can’t eliminate standing water there is a product called dunks and bits. Made from natural soil bacteria, they come in two types: granules or pellets. #2 on Consumer Reports’ list is Repel Lemon Eucalyptus. This products is natural, Deet free and promises 7 hours of protection against Aedes mosquitoes and deer ticks. When planning an outdoor gathering at night you want to make sure to spend your money on the most effective products. The cold truth about a myriad of barrier methods we have researched is that very few that have been tested are effective. Surely, there are anecdotal reports, but they are less reliable. Our sources include the American Mosquito Control Association and Consumer Reports. Products that use fans, electric grids or adhesive pads to capture and kill have had some success, says the American Mosquito Control Association. Set up an outdoor fan. They work. Experts say that wearing light colors is less attractive than dark ones. Dynatrap: Reviews are mixed, but consensus is that they do catch some mosquitoes. Read review. Off Mosquito Lamp: No conclusive evidence, only anecdotal references. Long considered a standard outdoor repellent, it gets a thumbs down by the experts. Studies show they are minimally effective, only up to a few feet. Less so if it is windy. Safety experts warn against yard foggers or misters that spray insecticide because of the risk of inhaling chemicals that have been linked to serious health problems. Wrist bands, sonic repellents and clip-on fans were tested by Consumer Reports and found to be ineffective. Are Plants Effective in Repelling Mosquitoes? In the course of research for this article I found claims from multiple websites that certain plants can repel mosquitoes. Their lists include plants such as Lavender, Marigolds, Citronella grass, Catnip, Rosemary and Basil. Unfortunately, when scrutinized by science, none passed the “smell” test. (no pun intended). Good news – there two plants whose leaves get high marks. When the leaves of the Lemon Thyme or Lemon Balm are crushed, the plant release the highest level of repellent properties. See photos and description below. By all means grow lavender, marigolds, basil and the like. They are beautiful and add color, texture and scent to your garden. Just don’t expect them to repel mosquitoes. Do you like to cook? Do you have an herb and or rock garden? If so, Lemon Thyme will be a welcome addition to your landscape. This low maintenance plant needs no fertilization, has many uses and when dried and crushed, its oils can help repel mosquitoes. Once established, it is drought tolerant – only needing water during extended dry periods. For cooking, Lemon Thyme is used to flavor poultry, seafood, stews, soups, sauces and as a garnish! A native to Europe this workhorse herb has an extra bonus. A University of Maryland study found its evidence of mood enhancing properties. When ingested in combination with other herbs such as Valerian, it also improved sleep. Check out this DIY recipe for making a Lemon Balm Tincture. Use it in recipes, teas, dry it and create a sachet. Bees also love it! It is a member of the mint family so the scent is a gorgeous fusion of mint and lemon. A great addition to an herb garden, it is also an ideal container plant.